This aortic aneurysm wrongful death claim was filed in Baltimore City after a vascular surgeon mistakenly cut a woman's aorta during surgery and neglected to call for a cardiothoracic consultation. It was filed in Health Claims Arbitration on February 22, 2018, and it is the 93rd medical malpractice case filed in Maryland this year. A 68-year-old woman had a diagnosis of three abdominal aortic aneurysms, meaning that she had three bulging, weakened areas in the main vessel carrying blood from her heart to her body. Physicians and radiologists at Johns Hopkins Bayview had been monitoring her aneurysms for two years when a CT scan angiogram showed that the aneurysms had grown to the point where surgery was required to repair them. The woman presented to the hospital for her scheduled endovascular aneurysm repairs. During the course of her procedure, the operating vascular surgeon mistakenly dissected one of the aneurysms. Because the dissection occurred so close to the woman's heart, the accepted standard of care required the surgeon to call a cardiothoracic surgeon for consultation during the procedure. Unfortunately, the vascular surgeon did not obtain a consultation, instead deciding to abort the procedure without repairing the dissection. The day after surgery, the woman complained of increasing right sided back and abdominal pain, as well as numbness in her feet. A CT scan confirmed the presence of the dissection, which had grown since the operation. By that time, the woman's kidney was not receiving any blood flow, so she was transferred to a tertiary referral center. The woman returned to the operating room on the day after her transfer, undergoing an ascending aorta and arch replacement. One week later she developed seizure-like activity and an irregular heart rate, requiring defibrillation. An MRI showed evidence of several small strokes. The woman was then transferred to a hospice care facility for end-of-life care where she died the next day. 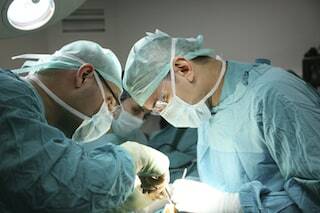 The claimant's expert witnesses, a cardiac surgeon and a thoracic surgeon, both believe that if a cardiothoracic surgeon had been called for consultation during the woman's surgery, she/he would have obtained a CT scan to better visualize the extent of the dissection; in which case, the woman would have likely undergone an immediate repair and survived the vascular surgeon's mistake. By the time a surgical repair was attempted, the woman had already suffered irreversible damage which resulted in her death. Many aortic aneurysm cases involve the failure to diagnose the symptoms. In terms of the signs and symptoms of an aortic aneurysm, there should be no real difference in the standard of care among different type of physicians for recognizing and taking the steps to confirm the diagnosis. So if a patient comes to a doctor's office or the ER with high blood pressure and complaints of radiating chest pain, that doctor needs to rule out the possibility of a dissection of an aorta and aortic aneurysm. Failing to obtain a cardiothoracic consult and perform a surgical repair in a timely fashion. Take a look at additional claims filed against Johns Hopkins. Learn about the average value of a wrongful death case in Maryland. Learn more about surgery malpractice errors and hospital malpractice.